Derived from Theraplay’s popular range of foot-propelled tricycles, the T5 Tricycle is designed for the more adventurous cyclist. Created with a robust frame that can absorb the bumps and hollows of our streets and pathways, the T5 gives the rider the ability to explore wider horizons with greater confidence. 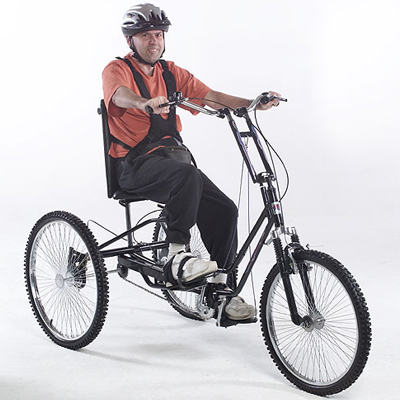 Theraplay’s design team have given special attention to the styling of the T5 Tricycle. Care has been taken to select components that will give maximum performance and enhance the appearance of the tricycle. Designed to suit the needs of teenage to adult riders, the T5 model incorporates a comfortable seating position that adjusts for growth, variable height handlebars and two forms of positive easy to use brakes. 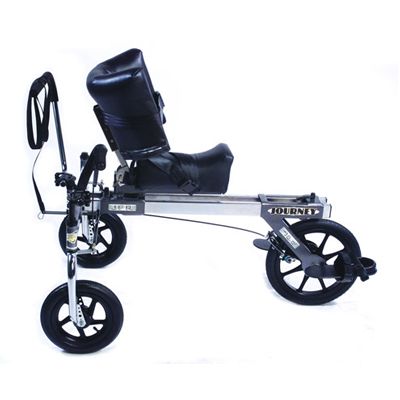 T5 Tricycles are available with a choice of three types of gearing. A 5 Speed Shimano Indexed gearing system gives the potential for longer distance rides where the rider is able to select the gear ratio depending upon the desired speed or gradient of hill. A single speed free-wheel gear is for riders who wish to cycle without the pedals constantly turning. This option will allow riders to navigate cycle paths and parks with ease. A fixed-gear provides the maximum therapeutic benefit for the rider and gives increased maneuverability. The foot pedals turn as the wheels turn, meaning both legs are given a thorough workout. This type of gearing enables the rider to control the speed of the tricycle with the foot pedals and to reverse if caught in a tight corner. Call 604-821-0075 or request details about the Triaid T5 Tricycle using the form below. Question about the Triaid T5 Tricycle ?